Dr. Hannum and the Hannum Vascular team are affiliated with Vein Experts . Along with our website, Facebook page, and community outreach, we are now able to provide even more educational content about vein disease, spider veins, and varicose veins to our Hannum Vascular patients. Congratulations, Dr. Hannum and team for leading the way with vein disease education, varicose and spider vein treatments, and superior expertise on total vascular leg care. Excited to share with you another happy patient of Dr. Scott Hannum, Vascular Surgeon, and Jessica Lebrón, ARNP-C. Here’s a perfect example of what to expect when having a varicose vein treatment at The Vascular Clinic and Cosmetic Vein Treatment Center! 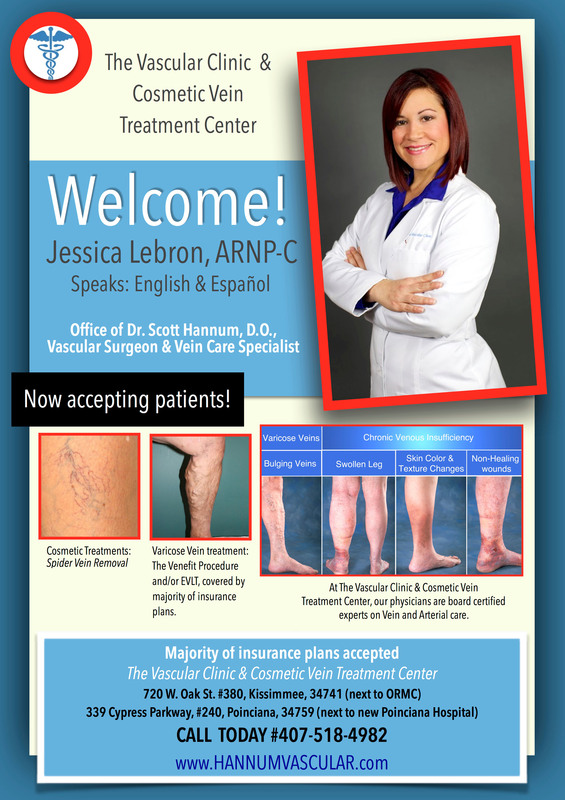 We are so excited to annouce Jessica Lebron, ARNP-C has joined Dr. Scott Hannum team of experts on vein and arterial disease. The Vascular Clinic and Cosmetic Vein Treatment Center is honored to have another caregiver to see patients in our Kissimmee and Poinciana office locations. Friday is a good rest day! Who needs to see a Vascular Surgeon? What we offer to Physicians and Community!